The constitution is wildly out of context in today’s uber-modern world. We have the Internet after all, which the founders could never have foreseen. We don’t need to arm ourselves like the citizen militias of yesteryear– we have law enforcement to protect us! The “archaic, out of context, constitution” is a favorite argument of today’s progressives (and many republicans) who clamor for a more bloated, all-powerful centralized government. The founders’ philosophies are obsolete, the constitution is a living and breathing document, say the progressives. But their hip new ideas are actually just dressed-up regurgitations of old, power grabbing endeavors from as long ago as the late 1700s. Luckily for every American since 1798, Jefferson and Madison decisively took action with their respective Virginia and Kentucky Resolutions of 1798. Motivated by the despotic inclinations of President John Adams, their resolutions forcefully reiterated “that the powers not delegated to the United States by the Constitution, nor prohibited by it to the states, are reserved to the states respectively, or to the people.” In Jefferson’s Kentucky resolution, when a state declared a federal law to be unconstitutional, that law was “void and of no force,” and thus nullified. Jefferson wisely saw that the judiciary’s role was being dangerously diminished, writing that “this would be to surrender the form of government we have chosen, and to live under one deriving its powers from its own will, and not from our authority” [emphasis mine]. The president had given himself the power to judge and sentence individuals, even when he was the sole accuser and his mere suspicions were the only presentable evidence. By highlighting and fortifying the role of the courts, Jefferson distinguished the United States from the European monarchies who could imprison citizens on a whim and throw away the key. 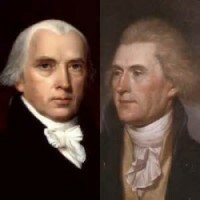 Thomas Jefferson and James Madison knew that presidential overreach was dangerous and unconstitutional; at great personal risk, they secretly wrote the Kentucky and Virginia Resolutions of 1798. Today, progressives try to dismiss their philosophies as archaic and outdated, but it’s clear that they are as relevant as ever. What’s missing from our current political landscape is more statesmen like Jefferson and Madison who are willing to stand against the bloating federal government as it continues to encroach and threaten what individual liberties we have left. Previous The Coloradoan engages in propaganda, sells-out credibility for Obama.